As the group of men struggle to survive and keep their sanity stuck under thousands of feet of earth, with almost no food, never certain that help is coming, it’s easy to get swept up in their tale. That’s when The 33 is at its best. At the same time, though, it never moves beyond a simple retelling of the events as they went down, as fate, circumstance, or whatever you want to call it, piles one trauma after another on the survivors. It’s hard to shake the feeling of watching a made for TV dramatization, especially as these events are so recent that you’re more than likely familiar enough with them to know how things turn out. The movie begins with a festive barbecue scene that introduces most of the main players viewers will spend the next two hours with. Not all of the men are introduced, as the majority of them never utter a word, aside from contributing noise to layered scenes in the underground caverns where everyone argues and shouts. And even these introductions are quick and superficial, providing the one key thing that character will have to define him. 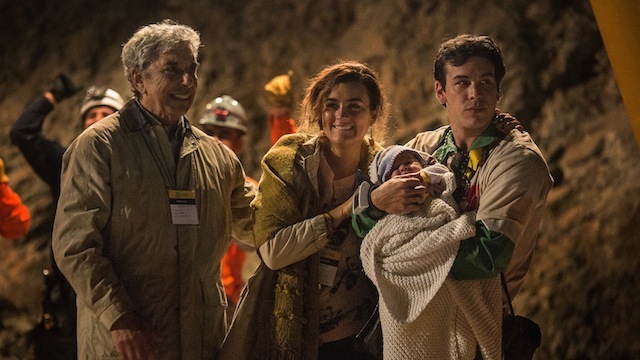 Mario Sepulveda (Antonio Banderas) is a devoted family man who adores his wife and daughter and wants to provide for them by working an extra shift on his day off, Don Lucho (Lou Diamond Philips) is a company foreman who knows conditions in the mine are not as safe as they could be, Alex Vega (Mario Casas) is an expectant father, and there’s even an Elvis impersonator and the obligatory about-to-retire-after-45-years guy. It’s easy to see where things are going from the opening scene, even if you don’t know the story. The miners are all hard workers, and though they have problems—like the alcoholic who has a longstanding feud with his sister (Juliette Binoche), or the guy (Oscar Nunez) cheating on his wife with the woman across the street—they’re still good guys. The executives at the mining company ignore the warning signs of an impending collapse, push too hard to fulfill quotas, and all the usual things uncaring corporations do in movies. And when the mine finally does cave in, the company immediately writes the men off as dead, but their families and one lone government bureaucrat (Rodrigo Santoro), push on. Banking almost entirely on the dramatic nature of the story, The 33 could have done so much more. By its very nature, the story is inherently engaging, but the characters are flat and rarely probe beyond the surface. Banderas is solid as the leader, “Super” Mario, but his role primarily amounts to a few moving speeches to the men about keeping hope alive. The families do little more than weep outside the fences and hold vigil for their men, and the attempts to dig them out of the ground are handled with quick procedural flourishes. Though it is an inciting incident, the threat of corporate negligence is dropped and never addressed, as is the idea that the government cares more about votes and bad publicity than the lives of the miners. The ideas are there, they’re just given the shortest shrift imaginable. Perhaps the biggest missed opportunity in The 33 is how the movie scarcely uses the setting to evoke any additional tension at all. Director Patricia Riggen never plays up the claustrophobic nature of their predicament, you never feel the pressure of the walls closing in on the miners. These could have been truly harrowing, visceral scenes, but while there is lots of talk of the men being “trapped,” and occasional moments where they’re at each others throats, the feeling of being stuck and entombed never comes across. In fact, aside from a single scene, a kind of dream sequence or group hallucination where the men imagine a single spoonful of canned tuna is their respective favorite meals, there are very few stylistic touches to set this apart. Opening shots of the wide-open Chilean landscape could serve as juxtaposition against the enclosed scenes to come, but these visual cues are spaced so far apart, and so rarely employed, that they never provide any of that stark contrast the should.